“So… what exactly is it that you do here?” You operate under a strange, infamous mystique around your vocation. You are rarely understood and often typecasted as doing for work what teens do in their spare time (all the time). You are a community manager. This year we’re getting a few friends together to spruce things up. 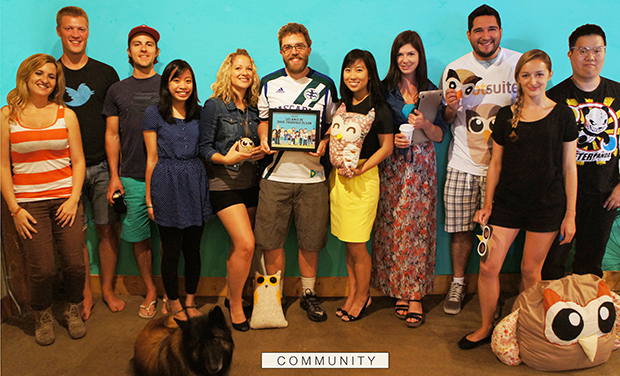 Please enjoy some special gifts as a token of HootSuite’s appreciation for community managers all over the world. Read on for a special free content announcement, a cordial invitation to the official Community Manager Appreciation Day G+ Hangout and a top secret community advisory council program. What is Community Manager Appreciation Day you say? Community Manager Appreciation Day is an initiative started by Jeremiah Owyang in 2010 aimed at celebrating community managers around the world. How does this crew celebrate such an illustrious day? Meetups, Tweetups, G+ hangouts, the usual… all the rowdiness you would expect! Take a moment on Jan 28 and congratulate your companies community manager – perhaps take them for coffee, beverage or at the very least, offer some social capital… Tweets, +1s, likes, hurray! Join acclaimed community managers from around the world for a 12 hour #CMAD Google+ Hangout! Featuring industry movers and shakers, expect to learn a few tips and tricks on all aspects of community building. Along with the fine folks at My Community Manager, your noble HootSuite Community Wranglers are hosting, all you have to do is drop by and celebrate the collective awesomeness of community. Come say a quick ‘hello’ with your morning Joe or afternoon tea. Keeners can hangout and rub elbows all day. #CMAD is about you. Celebrate your day, share some stories and make some new friends! Community Nuggets is a series of articles on high-level community building and management strategy. We see an opportunity to share insight from HootSuite’s unique perspective of building community. Community Nuggets explores how HootSuite initially built its brand using grassroots community tactics as well as how HootSuite continues to build flourishing international communities. Articles explore how to effectively crowdsource projects, use events to build your brand, build international communities on a budget, deal with PR conundrums, among others. The first article, ‘Easily Crowdsource Projects from your Community’, releases Wednesday Jan 16 on The Community Manager. Trust me. You won’t want to miss it! What is your plan for #CMAD? Share any events or initiatives in the comments and we’ll spread the love.